(Please excuse my thumb!) This is a fun card I created (after seeing a tutorial on Splitcoast) for an upcoming Wholly Scrap! class. I figured since the holidays were over, it was high time to start thinking about Valentine's Day, hence my love-inspired theme! The tutorial that was posted on SCS used this heart shaped Nestibilities die cut and since we happened to have had one in stock at the store...I decided to go with the same layout. This is called a Z-fold card because of the extra crease in the front of the card, creating a Z pattern. 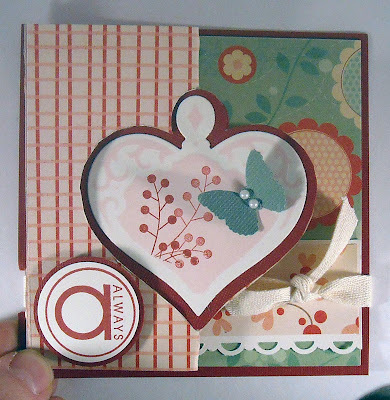 One of the fun things I liked about this heart die cut was that I could keep the die on the paper and then use ink and a sponge to add color to the base of the design. 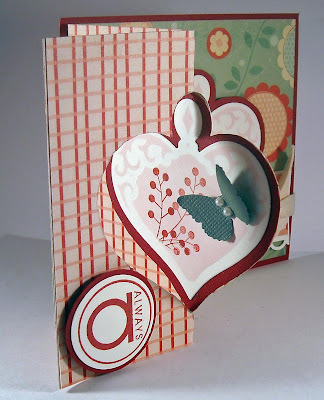 The heart die has some nice scroll work on it so it creates a lovely base for stamping. I used two retired SU! 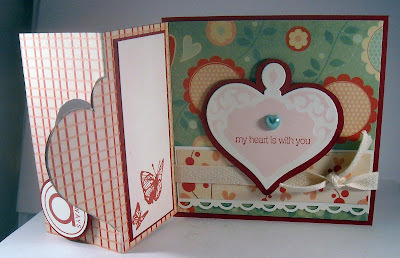 stamp sets to include some decorations on my heart and for sentiments. A Martha Stewart butterfly punch provided me with a sweet embellie from the front heart. Here's the card fully opened to reveal the heart on the inside of the card. I added a tiny pearl heart on the inside of the card. This wonderful paper (get ready to see lots of this design) is from My Minds Eye; called Be Loved. The butterfly images on the left side of the card are from Tim Holz. Call Wholly Scrap! for details on this class... Enjoy!! Or should I say Sweet 'n Sassy framed flowers! I've been hard at work on creating samples for upcoming classes but I needed a SNSS crafting break! I love my Sweet 'n Sassy stamps and miss them when I haven't used them in a few days... This card was inspired by a layout I saw in the new SU! mini catalog. The thing I really liked about the layout was a hint of newsprint peeking out from under designer paper. Reminded me of pulling off a piece of old wallpaper, to reveal a little surprise underneath! I even rolled up the edge of the designer paper for a more worn look. 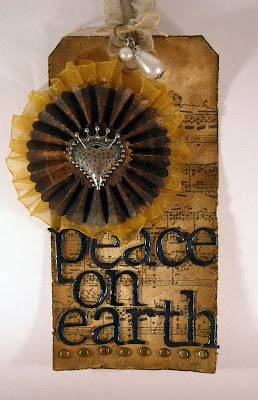 (The designer paper is from Ruby Rock-it....see I told you I never tire of this design!!) 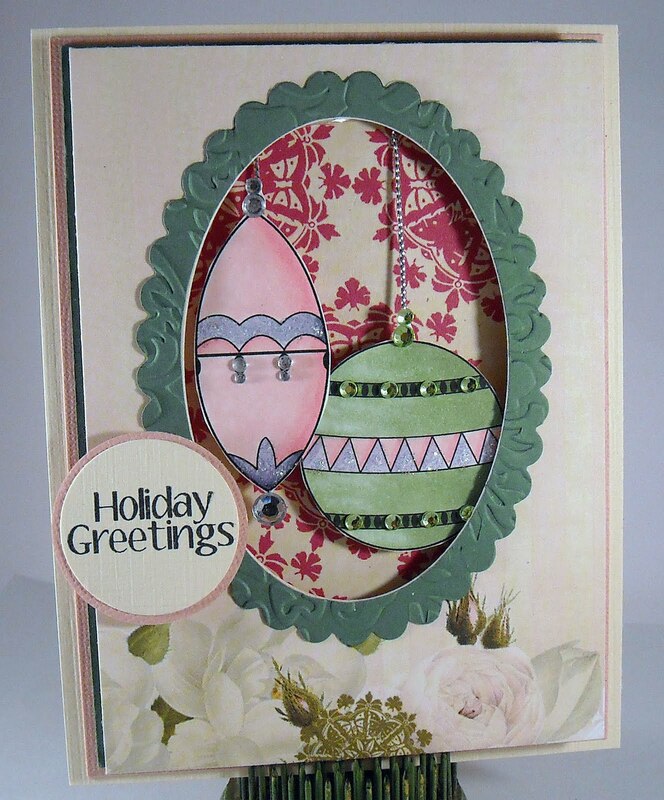 The frame was created using a label and oval die cut from Nestibilities. (The oval was placed inside the label die cut and then both were run through the Big Shot). 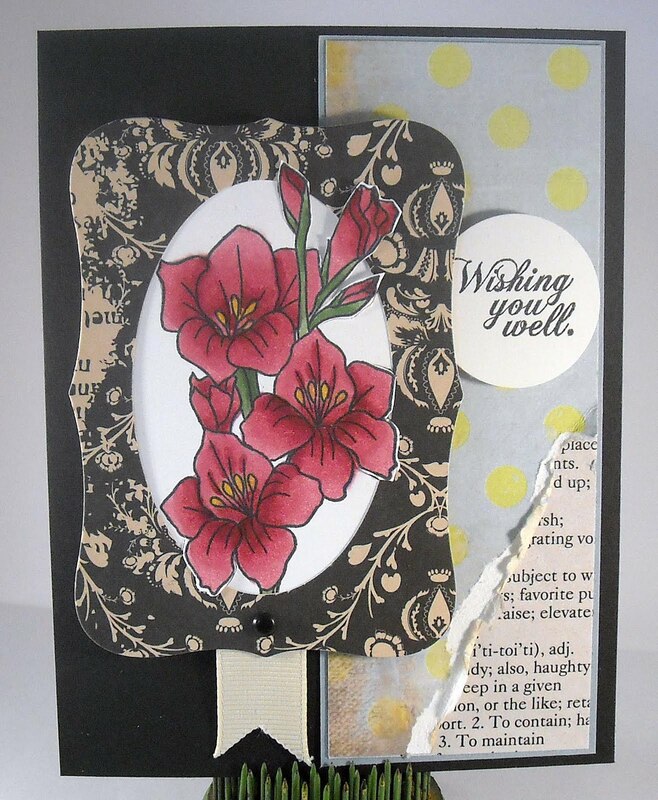 These lovely flowers are from the August Gladiola set from Sweet 'n Sassy. 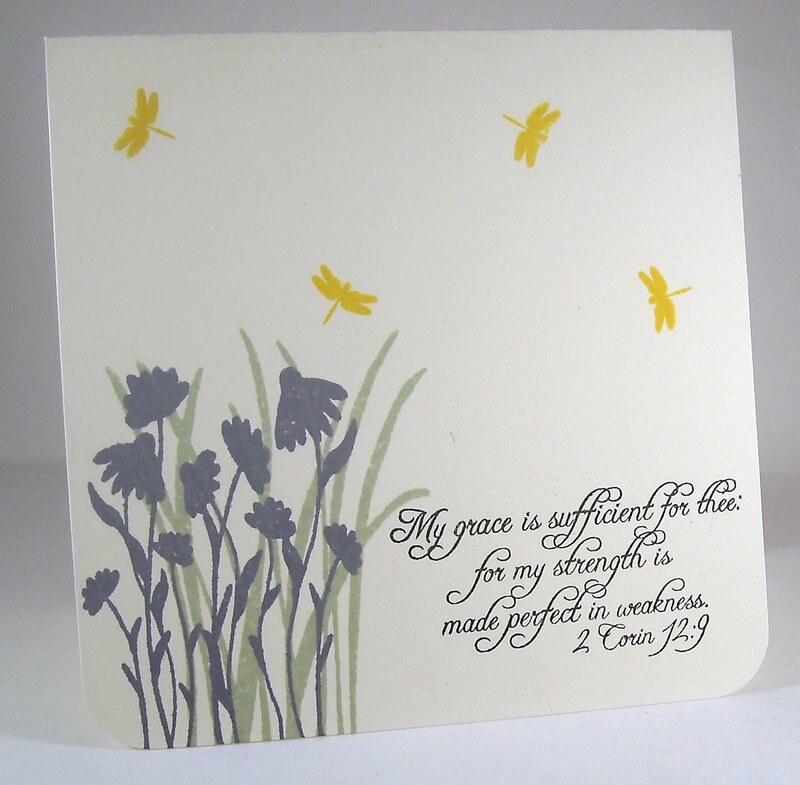 SNSS now has flower stamps for each month of the year...fabulous! I cut around a few of the flower buds so that they could extend over the edge of the frame. A tiny piece of ribbon and a brad was added to the bottom of the frame...just for a little decorative touch. The sentiment, also included with the Gladiola set, was stamped in a circle and everything was attached with foam tape. Enjoy!! Greetings! Hoping everyone had a wonderful Christmas weekend. We had such a great time and are now enjoying a wonderful vacation from work and school...love it! I confess that it's making me long for warmer weather....perhaps because we just got hit with a big snowstorm yesterday. We actually didn't get much snow in our town but the winds...holy cow the winds were crazy! It's made for some very cold days so I needed to create a bright spring-themed card to remind me that soon enough the days will get warmer! 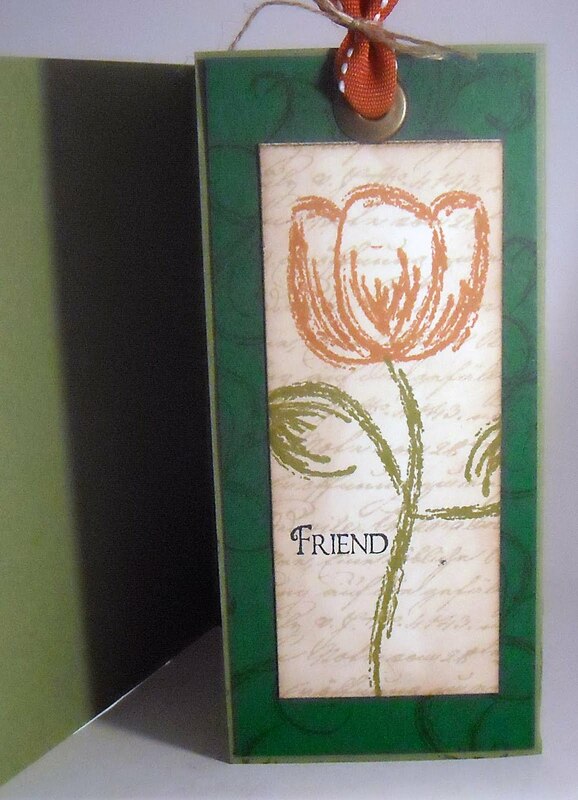 This is a bookmark card, which is a standard size card (5.5" x 4.25") with a 2.25" bookmark attached. I used a perforating tool to create the crease for the bookmark, which enables the receipent to simply tear away the bookmark from the card. Many of the samples I saw of this type of card placed the bookmark on the inside of the card. However, I saw one sample with the bookmark on the outside, using a die cut shape to hold the card closed. I loved this idea and opted to go with the outside look. I used a wonderfu floral stamp set from Our Craft Lounge for this card; the name of the set is Spring Sketches. 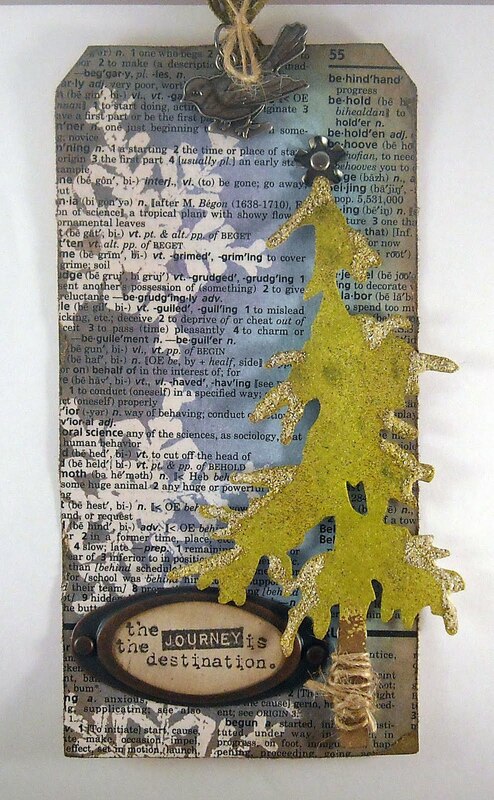 The script stamp in the background of the bookmark is from a Tim Holtz holiday set. The stunning paper on the front of the card features a beautiful flocked swirl in a deep green. The paper is from Ruby Rock-it and I have been using this line for months now...I never tire of the vintage look and great colors. 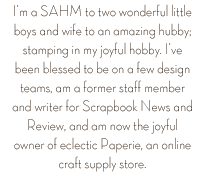 I used a Label die cut from Nestibilities to create a tab to hold the card closed. Fun stuff! 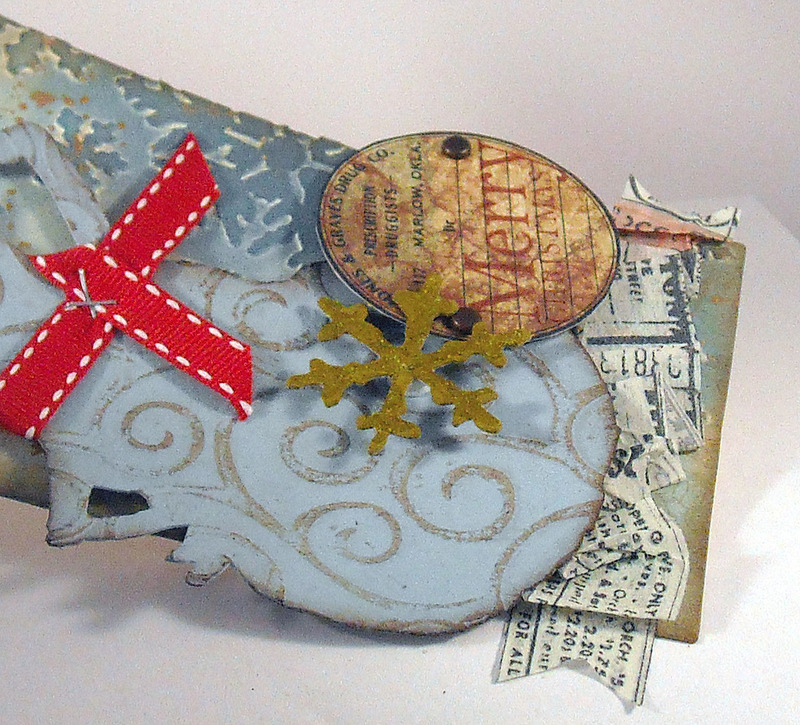 I'll be demonstrating this card, along with two others, at an upcoming Wholly Scrap! class. Contact the store for more details... Enjoy! Hi there! 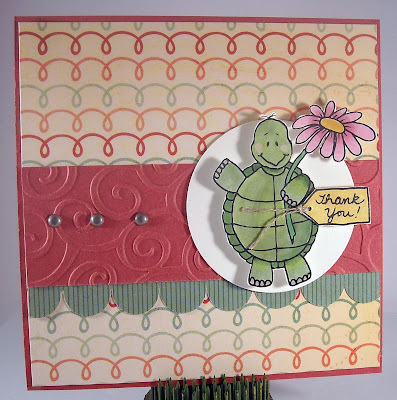 I've got a card, featuring this darling turtle image, posted on the Sweet 'n Sassy digi blog today! Check it out here! Wishing everyone an amazing a blessed Christmas!! It's time again for another SALT challenge and this week it was Hazel's turn to set the challenge. Since it's so close to Christmas, she chose a great topic...The Greatest Gift; the birth of Jesus Christ. She had an excellent write up on the SALT blog, I recommend giving it a read! (See the inside of my card below) I've opted to re-post portions of a devotion from Charles Spurgeon, which focuses on the text from John 7:37, "If any man thirst, let him come unto Me, and drink", and although this verse doesn't specifically focus on the birth of Christ, it focuses on what He came to do in the hearts of man. Christ's proclamation is made most freely, that every thirsty one is welcome. No other distinction is made but that of thirst. Whether it be the thirst of avarice, ambition, pleasure, knowledge, or rest, he who suffers from it is invited. The thirst may be bad in itself, and be no sign of grace, but rather a mark of inordinate sin longing to be gratified with deeper draughts of lust; but it is not goodness in the creature which brings him the invitation, the Lord Jesus sends it freely, and without respect of persons. The sinner (and we are all sinners by nature) must come to Jesus, not to works, ordinances, or doctrines, but to a personal Redeemer, who His own self bare our sins in His own body on the tree. The bleeding, dying, rising Saviour, is the only start of hope to a sinner. No waiting or preparation is so much as hinted at. Drinking represents a reception for which no fitness is required. A fool, a thief, a harlot can drink; and so sinfulness of character is no bar to the invitation to believe in Jesus. We want no golden cup, no bejewelled chalice, in which to convey the water to the thirst; the mouth of poverty is welcome to stoop down and quaff the flowing flood. Blistered, leprous, filthy lips may touch the stream of divine love; they cannot pollute it, but shall themselves be purified. Jesus is the fount of hope. 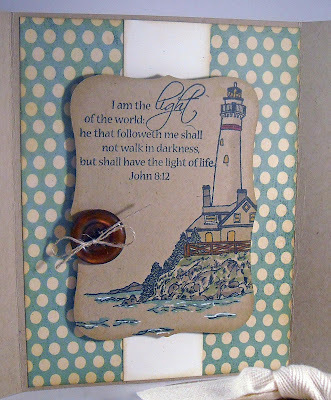 Hear the dear Redeemer's loving voice as He cries to each of us, "if any man thirst, let him come unto Me and drink..."
As for my card, it's a bit like a package...I created a tri-fold card and held it closed with a belly band and twill ribbon. The inside image is from Sweet 'n Sassy and is available as a digi set; Light of the World. I kept my coloring simple, as well as my design, instead highlighting this wonderful text from John and showing off the great colors from the My Minds Eye (this line is called Be Loved). Enjoy today's card and be sure to visit the SALT blog for the other crafty goodness from the DT! Is it too late to post Day 12? Nah!!! Sorry I've been MIA for so many days...the Christmas prep madness finally took over and it was nearly impossible for me to get much crafting accomplished. (This tag was actually finished on day 12 but I just managed to take the photo...how sad is that!? LOL!) 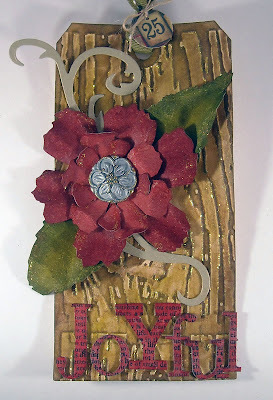 This was a quick and easy tag...the background was covered with paper from one of Tim's paper stacks (love how the papers in the stacks are already aged and vintage-looking...no need to distress anything!) I added two metal brackets, one at the bottom and one at the top. 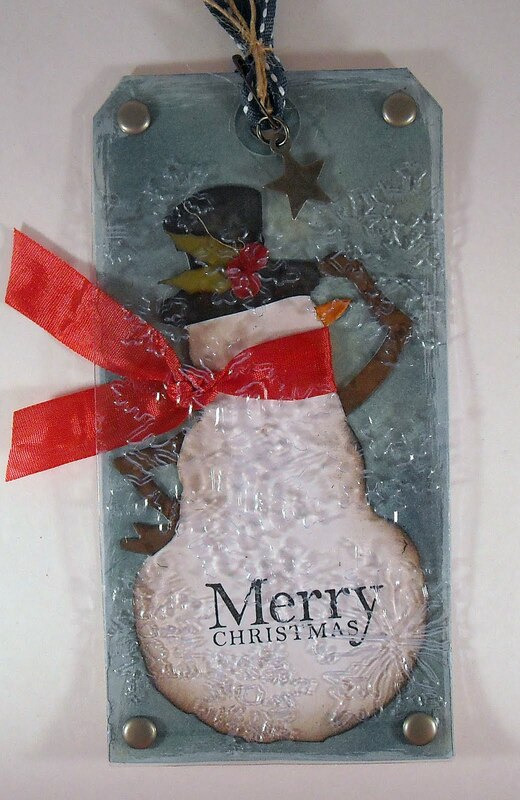 The snowman was cut out using an Idea-ology die. I then ran the snowman back through the die, only this time I cut the snowflake shape out of his belly. :-) I then covered said snowman with matte finish glue (kind of like Modge-Podge) and poured this yummy blue glitter all over him! (Who wants to guess whether or not glitter was also all over me and the craft room!) Once the glitter was dry and set I attached the snowman with foam tape and added the December calendar (also from the paper stack) to his front, attaching it with a binder clip (from SU!). Two sparkly foam snowflakes and a few baubles were the finishing touches! Enjoy and check back often this week as I'll have posts on a few days leading up to Christmas. It's Day 11! One more day until the jouney of tag creation comes to a close! It's been a blast and I hope you've enjoyed seeing the tags and hearing about the techniques. Don't forget to visit Tim's blog for full and specific details on the techniques. 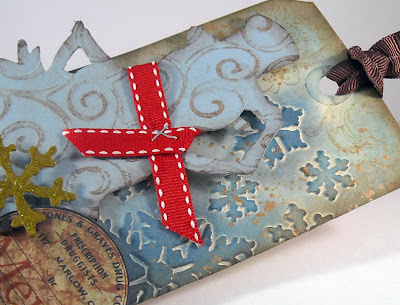 Today's tag features resist embossing. 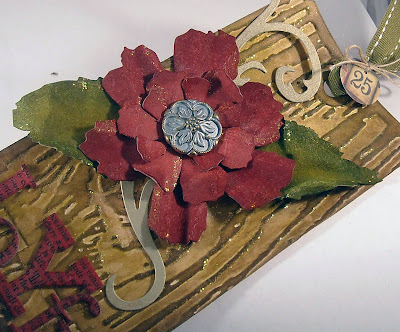 (On Day 11 Tim created his own custom stamps using his dies, left over packaging, and stamp foam. It's amazing! Check it out here...) I opted to simply use a big snowflake from the Grunge Flakes stamp set. I started by attaching a dictionary page to the tag. I used Zip Dry to attach the page and then sanded the edges for that vintage look. 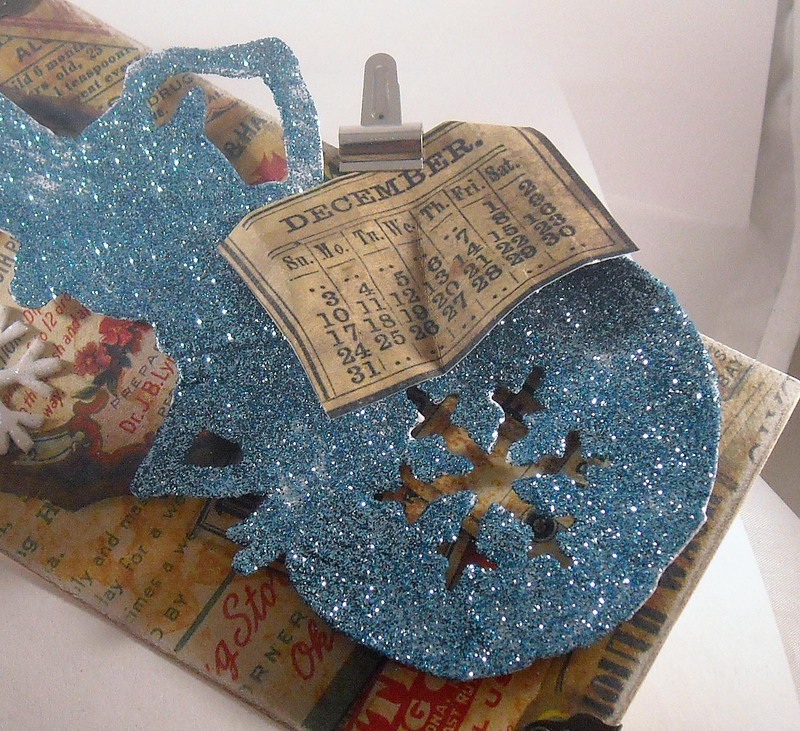 The snowflakes were added by using embossing ink and clear embossing powder. Once the embossing powder was set I sponged purple and blue ink over the tag, revealing the snowflake image. (I really liked using the purple on this tag!) Brown ink was added to the edges. 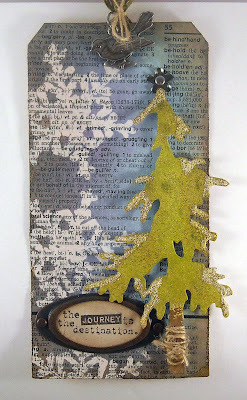 The pine tree was cut using an Idea-ology die and was embossed with Distress Embossing powder. This was the first time using the distress powder and it is very interesting as it creates a rough, almost sandpaper-like, finish. I then added distress Stickles to a few of the tree branches to mimic snow. A piece of twine was wrapped around the tree trunk and a sentiment, from Tim's new Odds and Ends stamp set, was attached to a metal bracket. (Tip: I always had a hard time finding a way to attach a piece of paper behind the metal brackets because there's such a tiny spot for glue on the bracket. I found that using Glossy Accents was the perfect solution! Just a dot of Accents is all you need to firmly hold the paper in place on the bracket.) A few metal embellishments, a star on the top of the tree (which is really a metal flower) and a bird on the ribbon, finished off my tag. Enjoy and be sure to check back tomorrow for the final tag!! Welcome to Day Ten!! Only two more days to go!! I can't believe I managed to get all 12 tags done this year...Of course I have yet to do my Christmas shopping and our tree barely made it up last night. Since that's the case, I request a week's extension on the celebration of Christmas. Anybody with me? Today's tag was a super easy tag to create. And while it was an easy tag it includes one very creative use of garbage. Hum...see any garbage? Well do you see that very cool snowflake covered "icy" piece on top of the snowman? That, my friends, was created with a discarded piece of packaging! Isn't that amazing!! Tim just has a creative mind like no one else! I was floored when I read his tutorial on today's tag. I would never consider using the side of a plastic box. I used the tag die cut to get the plastic to the size and shape that I wanted and then ran the cut piece of plastic through the snowflake embossing folder. The snowman was cut out with an Idea-ology die, designed by Tim. Two snowmen were cut out and then just the arms, nose, and hat of one were colored with Distress Ink. Those pieces were then cut off and glued on top of the plain snowman. Not only does this add just a touch of dimension but this method also keeps ink from getting on to the white part of the snowman. Another great idea! The holly branch was hand cut from cardstock; the berries were punched from red cardstock. The sentiment, from Sweet 'n Sassy, was stamped in black at the bottom of the snowman. The ribbon was colored red by using alcohol inks and the large brads are an antique silver, to stay with that vintage look. 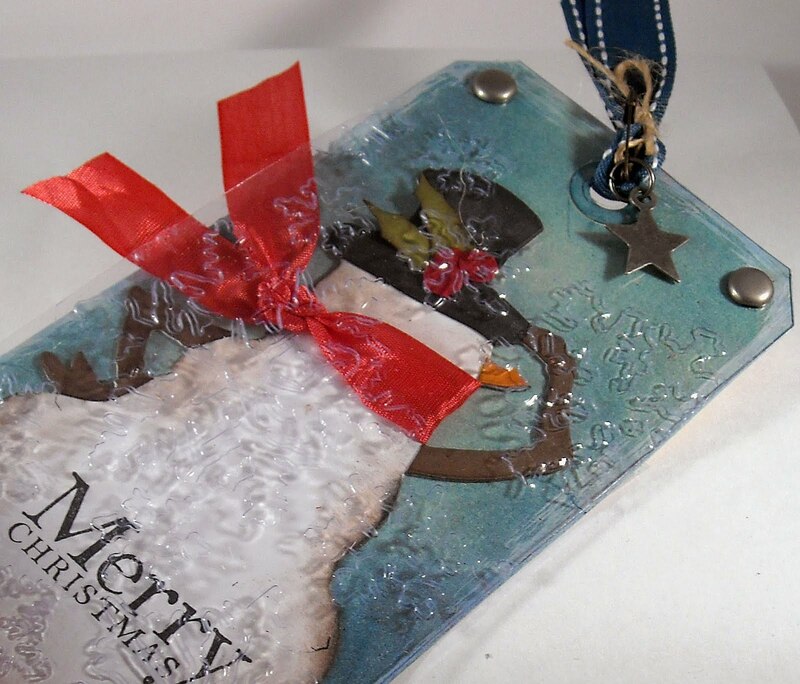 I just loved today's tag and can see putting all kinds of die cuts under a plastic sheet...humm...it's kind of like looking at the snowman through a frosty window. Cool... Enjoy! Greetings! I'm back with the Day Nine tag and I love it! (Oh heck, I've loved them all this year!!) 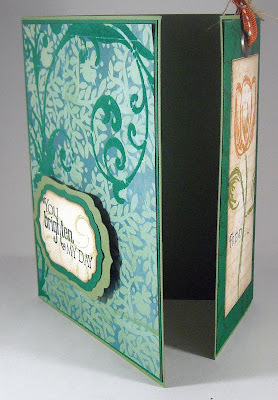 Today's tag features the new paper rossette die cut, from Idea-ology (designed by Tim Holtz). This is one of those dies that I purchased but was kind of on the fence about how I was going to use it and then...I used it...and I used it again...and again...Well you get the picture. I love this die! 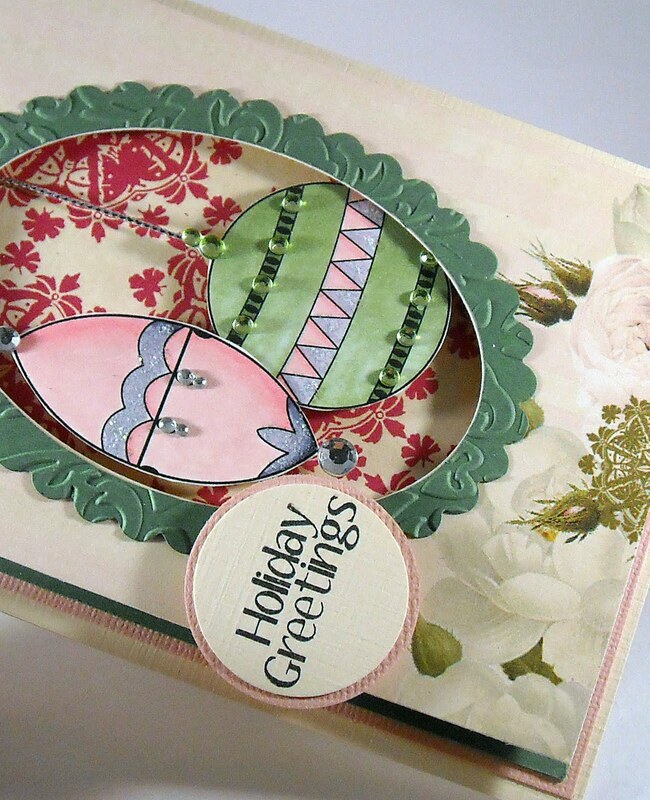 It's super quick and easy to assemble and it's a great size, big enough to fill a substantial space but not so large that it's too big for a card or tag. The other fun element on this tag are the letters that are covered in glossy accents. Oh, that high shine looks amazing on the grungeboard letters, which were simply covered with black Distress Ink. The background on the tag is a music stamp from the Festive Sounds stamp set. The brads along the bottom are from Idea-ology as well as the metal embellishment on the rossette and pearl embellies at the top of the tag, attached to the ribbon. Tim used some tinsel on the back of his rossette, which was very fun, but since I didn't have tiny tinsel I opted for this gold sparkly ribbon that was attached with red line tape. Tim also added some lovely buttons to his Day Nine tag, however, my letters were large so there wasn't much room left for the buttons (but I did mange to buy the buttons anyway...) Tim...you're such an enabler. :-) Enjoy!! I know, I know...where is the next tag? No worries, I'll be back tomorrow with the Day 10 tag...as well as days 11 and 12! And I have had a blast with the tags but you know what? 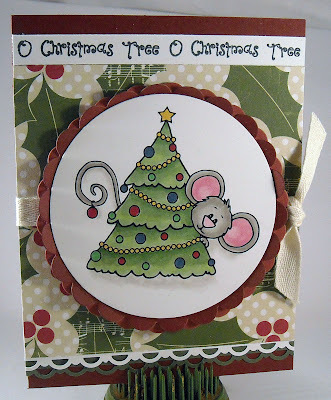 I missed my little Cocoa buddy and my Sweet 'n Sassy stamps so I had to whip up a simple Sunday card for everyone, using a brand new digi called Cocoa's Christmas Tree. Isn't he so cute peeking out from behind the tree? Love it! Speaking of trees...does everyone have theirs up yet? We still haven't! Yikes, I'm running late this year! This layout is one that I found in a SU! mini catalog and I thought it would be the perfect way to showcase this darling image. Once Cocoa was colored (with Copics) and cut out using a plain Nestibilities circle, I cut out two scalloped circles from a dark and light shade of burgundy cardstock and layered one circle on top of the other. Once Cocoa was attached, I bent up the scallops from the top scalloped circle. It added just a hint of dimension...very fun! 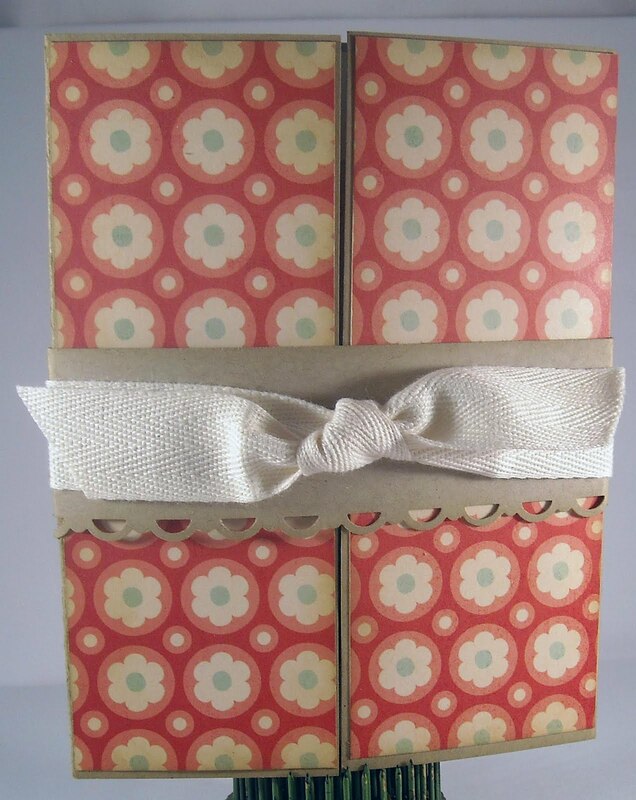 (You can click on the photo to enlarge the image) The fun holly paper under Cocoa is from the brand new Echo Park line, which everyone is raving about...it is quite fabulous! 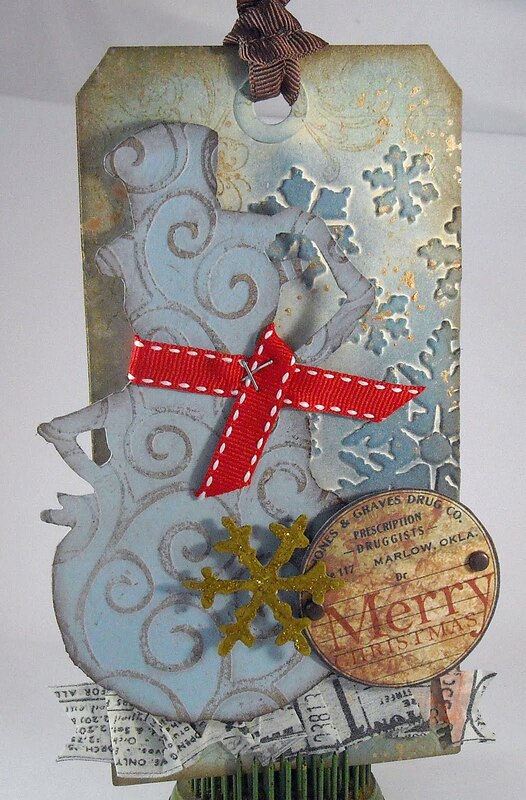 The sentiment across the top is from the O Christmas Tree stamp set, and the twill tape around the card is from SU! The bottom scallops were created with a SU! punch. Enjoy and be sure to check back late tomorrow for the next tag!! 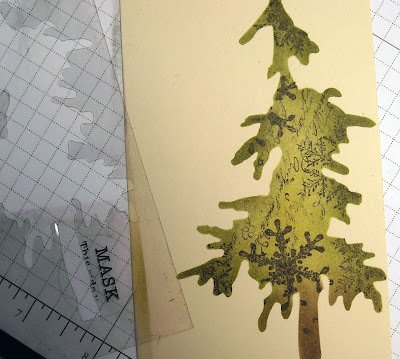 I started with masking sheets, from Idea-ology, and used the pine tree die cut to cut out the image from a making sheet. I now have my own custom pine tree mask! Here are the positive and negative images. 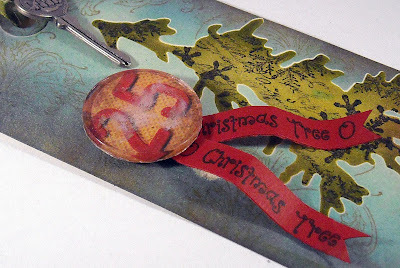 I attached the negative to my tag, with the pine tree opening vs. the actual tree covering the tag. 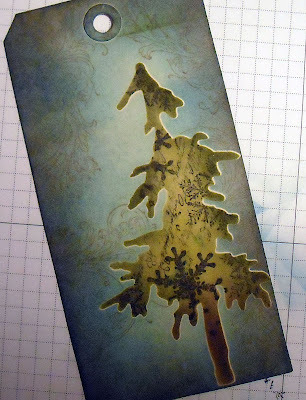 Next I used my blending tool and Distress Inks to color the tree. 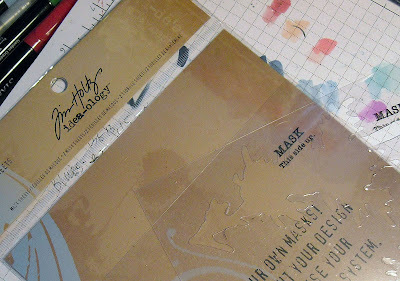 Using the mask allows you to ink all over the mask without ruining your tag. 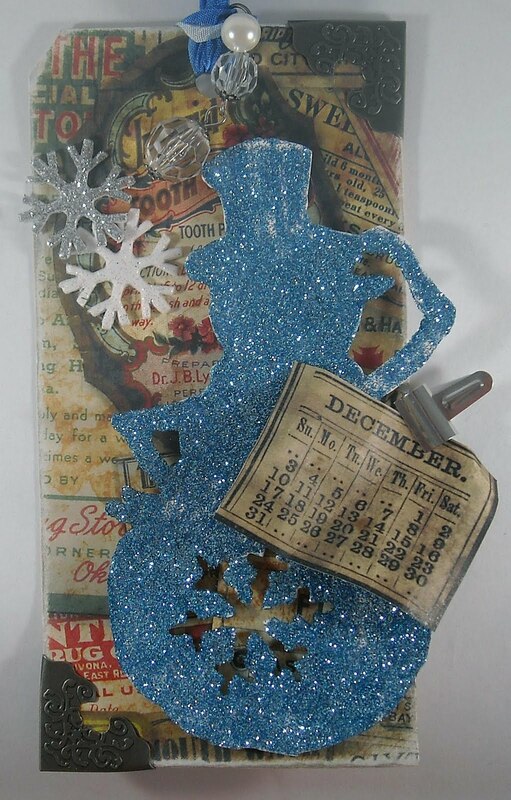 Then I added a few stamped designs to the tree; snowflakes and script. Once you're finished stamping and coloring, just use a paper towel to remove ink from the mask, attach the backing to the mask, and store. Here's my finished tree, with the mask removed. Now I'm going to use the positive tree image to cover my tree so that I can finish decorating my tag. 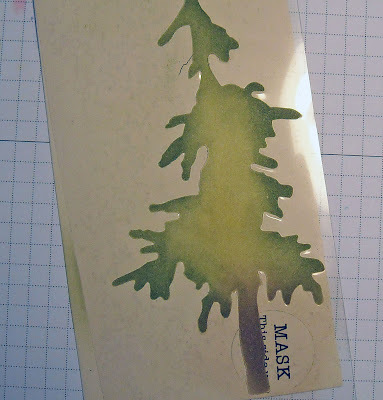 Since my tree is protected by the mask, I can add color to the back of the tag as well as more stamped images. I used a swirl image on the background. The mask keeps the tree from getting ruined by the other colors and stamps. Once done, simply remove the mask and store. Cool, huh? Once my tag was decorated I added some metal embellishments to the bottom of the tag (this babies have been hanging out in my closet since last Christmas...remember I didn't have any of those fabulous embellies last year?? Well I do now, thanks to Wholly Scrap!...they're such enablers over there...hee hee) I then used a circle fragment to add the 25. The fragment is attached to the paper with glossy accents. I also added a bit of Stickles to the paper for some sparkle. I created my paper ribbons by stamping the sentiment (from Sweet 'n Sassy) on red cardstock. A few metal keys (another of those metal goodies) was attached to my ribbon. And that's it for today's tag!! We're nearing the end...can't believe it's been 12 days already and I've managed to not get a darn thing done except stamp...humm...it's not a bad way to spend your time! :-) Enjoy! Before we get started with today's tag, I wanted to share the name of the Tiffany Doodles blog hop winner, and winner of the darling Pocket Mouse digi image. Mercy...I am so excited about the next few tags!! Not only has Tim been creating some really beautiful tags but there are new techniques to learn! Yeah!! My main goal in making these tags (besides the pure joy of creating!) is to duplicate the techniques that Tim demonstrates, even if I don't have the specific embellies he uses. 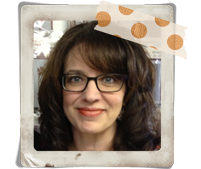 If you compare my day six tag with Tim's, you'll see that my background image, die cut, embellishments, and ribbon is different. However, I've used the exact same technqiues to create my tag. 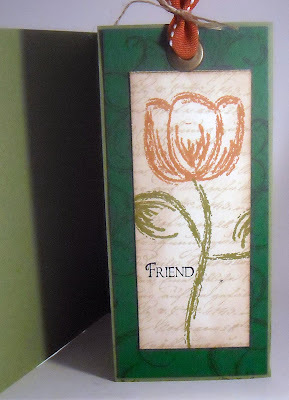 I kind of enjoy seeing a differnet version of the tag... :-) Today's tag used embossing folders (aka texture fades) to add this amazing dimension to the tag. 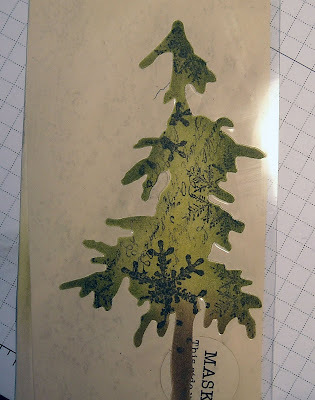 I used Tim's (I say Tim but it's technically Idea-ology) snowflake embossing folder to dry emboss my tag. I then added Dsitress Ink, in various blue shades, some stamped swirls, and gold speckles by using a paint dauber and stamp. I then use the snowman die cut (also from Tim) to cut the image out of grunge paper. Mr. Snowman then got another ride through the Big Shot when he was embossed with another embossing folder from Cuttlebug. And if that wasn't enough, he was painted, sanded, and aged before receiving his red ribbon scarf, which was attached with the tiny attacher. Tim used the tissue tape again (loving this stuff!!) to add a border to the bottom of the tag. 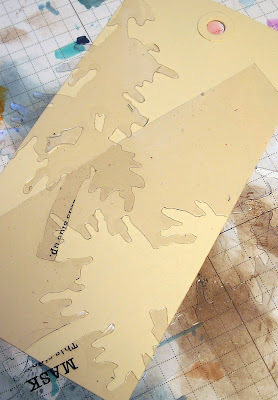 This is a really quick and easy way to add a unique dimensional touch to projects. My circle was cut out of a piece of paper found in one of Tim's paper stacks. I simply added the Merry Christmas sentiment and two brads. A sparkly snowflake was my final touch! Be sure to check out Tim's blog for the specific details on these techniques and stay tuned for tomorrow's tag!! WooHoo!! I'm back with Day Five of Tim's 12 Tags of Christmas! I've got three tags just waiting to be posted and I can hardly wait! 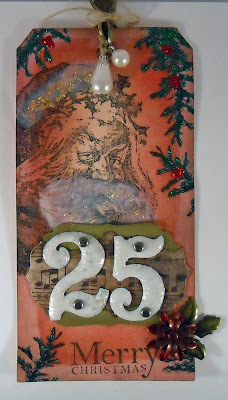 Tim is just rockin' the tags this year, so many techniques, using fun embellishments, the ink..it's the best! Before we get to today's tag I wanted to share a comment that a friend of mine left yesterday about wanting to make the tags but not having the supplies. Anyone else feel like that? Well...I have an idea...Last year I had very few of the supplies that Tim used on his tags (now that I'm working at Wholly Scrap!, I have far too much easy access to fabulous craft products!!) so my challenge was to use the techniques that Tim used on his tags but to create mine with only the supplies I had on hand. And I have to say that it was a blast! 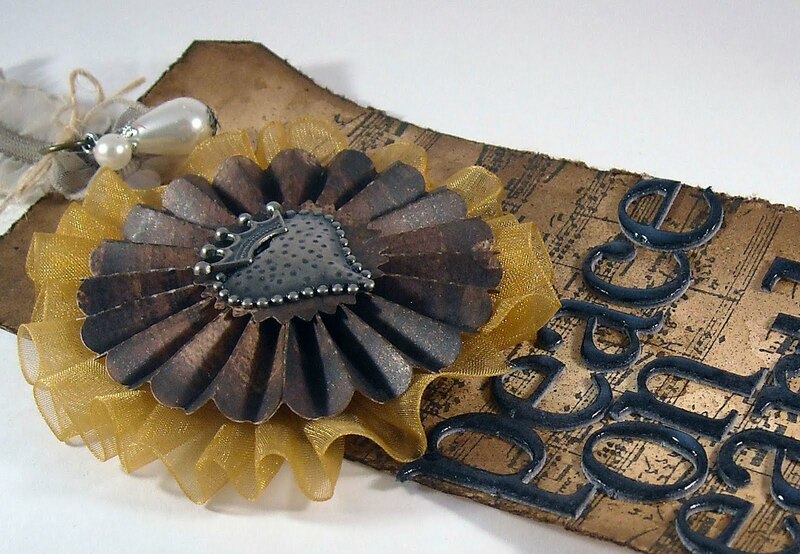 It was great to think of way to even re-create some of the embellishments that he used, like faux metal tags. You can see an example here. So, if you don't have the supplies, don't let that stop you...Jump right in and have fun creating!! (I even made non-holiday tags last year!!) OK, on to today's tag! Interestingly, I didn't have the facets that Tim used on his tag (although I now need them! ), so I left that off. However, you should check out the very cool technique he demo'd on creating custom facets. (I tried the technique using Fragments, which also worked). However, I did happen to have the metal numbers in my stash along with the metal flowers so I was able to add those embellishments to my tag. Heat embossing the metal numbers was very cool...I would never think of doing that or of using paint (vs. ink) as a medium for the embossing powder (Tim used extra thick embossing powder). Once the embossing powder dried, the numbers look like enamel, very cool! The rest of the tag is pretty self-explanatory...Some Distress Ink on the tag background, a few Nestibilities labels as a base for the numbers, and lots of Stickles! Be sure to check back on Friday for the next tag...or maybe I'll do a double post tomorrow with SALT and the day six tag...I so excited about the next two tags! I'd say they were my favorites but I think I said that about days two, three, four.... :-) Enjoy! Welcome to the Tiffany Doodles Blog Hop and monthly challenge! Over the next three days you'll have an opportunity to get to know our talented Design Team, see all of their fantastic eye candy they have in store for you, and enter multiple drawings from free digis! If you get lost along the way simply return to the Tiffany Doodles home page for the Hop List! Ready to get started? Please be sure to read through the entire post for full details on the Challenge and the Blog Hop. Let's start with this month's challenge, which is to create a holiday-themed card or project. On my card I used the brand new Christmas Ornaments digi set, which comes with three ornaments. One of the things I really like about digi images is that you can alter the size of the image. 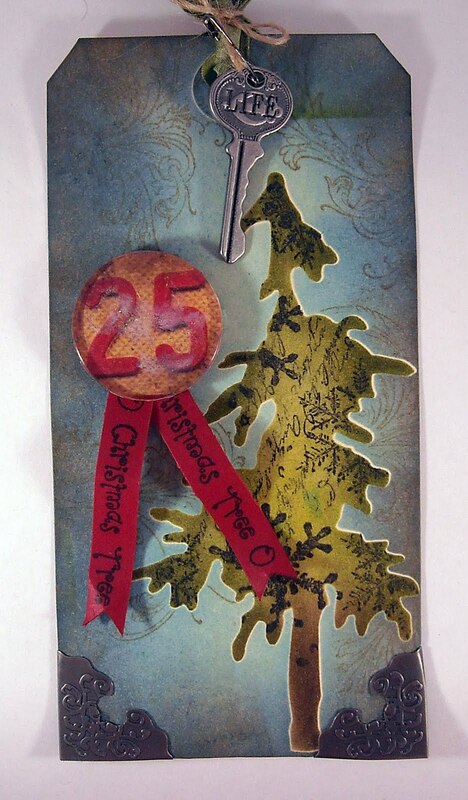 For today's card I knew what size my cut out window would be so I changed the size of the ornament images to fit the opening. Once my images were printed I colored them with Copics and covered them with lots of bling; rhinestones and Stickles. Very fun! The paper I used is from Webster's Pages (that fabulous fushion patterned paper is on the back of the pale floral paper on the front of my card...isn't that a fun mix of colors and designs! ), and the sentiment is from Sweet 'n Sassy. So...here's your challenge for December. Create a Christmas themed card or other project and add a link back to your blog or online gallery on the Tiffany Doodles site. You have until December 31 to post! We'll draw four winners who will win the following: 1st place - 7 digis, 2nd place - 5 digis, 3rd place - 3 digis, 1 Random - 3 digis. 1. Put the pretty shiny Tiffany Doodles button in your blog's sidebar (shown on right)! (click here to pick your color & get copy/paste code) 2. Follow this blog if you aren't already! 3. Stop by everyone's blog and sign up to follow theirs too! 4. Leave a comment on everyone's blog! (Did I mention prizes at every stop on the blog hop?!?!) 5. Return to the Tiffany Doodles site and leave a comment for 3 Grand Prizes! 3 digis each for 3 random winners! My prize drawing will be for the Pocket Mouse, who is so, so cute! I used this image to create this project last month. Just leave a comment here to be entered into the drawing! The winner will be drawn on December 10. And here's the blog hop order: Official Site Tiffany Doodles Tiffany Richards Tiffany's Garden Cammy Wall Pink Room Therapy Collette Landwer Heaven Sent For You Donna Mikasa 3 Umbrellas Jeannie DeGruccio The Polka Cabana Jillian Foster Inspired By Jodi Ann Lee Inked Inspirations Karen Baker The Bald Dragonfly Kim Schofield Paperie Petals - You're here!! Lindsay is next! Lindsay Amrhein Note to Self Lisa Summerhays Lisa's Handmade Cards Pattie Goldman The Pampered Paper Patch Peet Roeven Scrap Album Shannon Neparko Desert Design Studios Simone Naoum Designs by Simone Sue McRae Inky Fingers Willemien Katerberg Styles in Paper Some other TD news we're excited to share... Tiffany is almost finished with the new Tiffany Doodles store!! There will be a real shopping cart, with easy to find digis, coupons, memberships, and so much more! Stay tuned, she's hoping to open around Christmas! Tiffany Doodles is having a great sale right now "Buy 3 Get 1 Free". Purchase your 3 digis as usual and then email your free choice to me! 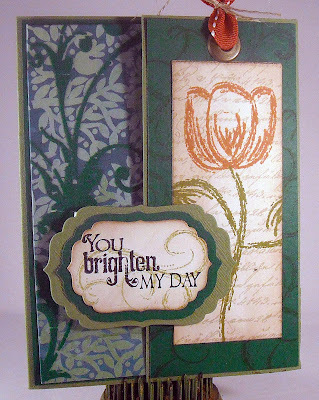 Enjoy today's blog hop and stop by tomorrow for Tim's Day Five tag! !